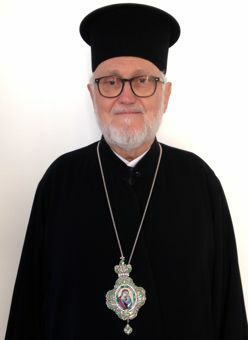 On March 28th 2016, the Assembly of the Exarchate met and made recommendation that the then Patriarchal Vicar and Locum Tenens of the Exarchate, Bishop John (Jean) of Charioupolis, was their candidate to fill the vacancy for which he was already Locum Tenens. On April 22nd 2016, His All Holiness, the Ecumentical Patriarch Bartolomew wrote to confirm that the Holy Synod has, on his recommendation, raised Bishop John to the rank of Archbishop, and appointed him Patriarchal Exarch of the Orthodox Parishes of Russian tradition in Western Europe. Most Reverend Archbishop John of Charioupolis, beloved brother in the Holy Spirit and co-celebrant of our modesty, Patriarchal Exarch of the Orthodox Parishes of Russian tradition in Western Europe, may the grace and peace of God be with your Eminence. Through (this) our (handwritten/signed) Patriarchal letter, we inform your Eminence that, by decision of the Synod, the Sacred Mother Great Church of Christ, at our own Patriarchal recomnedation/proposal, wishes to honour your Eminence by elevating you from the rank of Bishop to that of Archbishop, honoris causa, and appoint you as Patriarchal Exarch of the Orthodox Parishes of Russian tradition in Western Europe which are under our Sacred Apostolic and Ecumenical Throne, (an appointment) which is in accordance with the decision of the Extraordinary General Assembly of the Exarchate which met on the 28th March of this year. As we gladly convey this decision to you, your Eminence and dearest brother, we congratulate you with brotherly heartfelt feelings, and wishing you long life and long archpastoral service and contribution in this new capacity to the Mother Church and the (above mentioned) Orthodox people in Western Europe, we conclude (this letter) with the blessing of the Mother Church together with our own Patriarchal brotherly wishes and we embrace you in a brotherly manner and call God's grace and boundless mercy upon you.